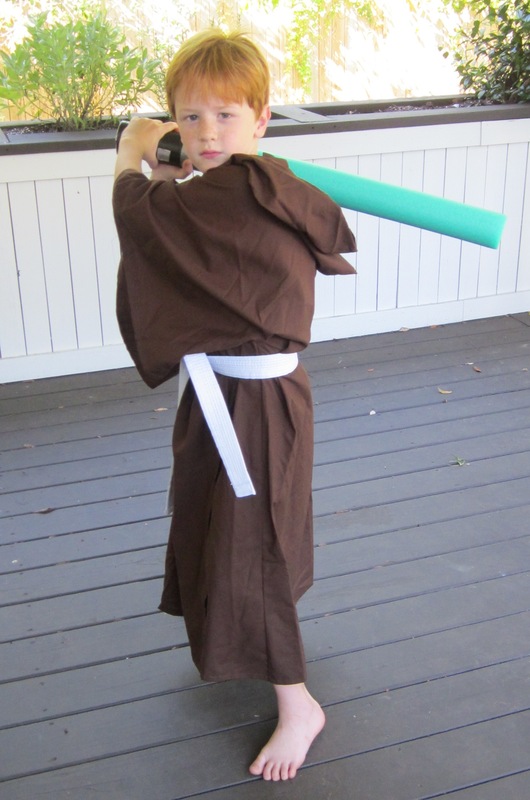 It started out as a Jedi bowling birthday party and turned into a Star Wars sleepover. For my son’s 8th birthday, we had three friends meet us at the local bowling alley. 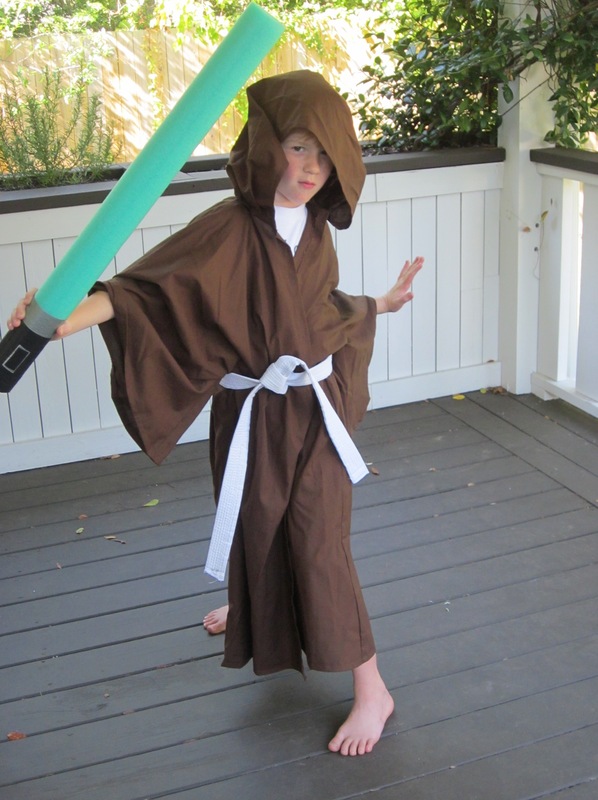 We then took the boys home and gave them their Jedi costumes. After the boys finished beating the snot out of each other Jedi training, we served hamburgers, ice cream sundaes, and topped off the evening watching the original Star Wars movies. 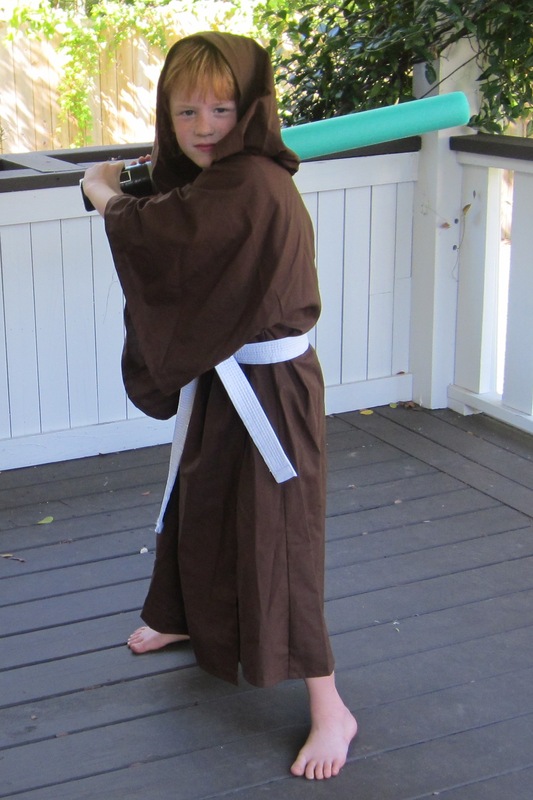 The Jedi Outfit: When I visited my sewing sister this summer, she set me up on her sewing machine, and I actually made the Jedi robes myself! If you can sew a straight line, you can do these. I will say you need a lot of fabric (which can be expensive), so I was glad my son wanted just 2 or 3 friends. Our local karate school gave us the white karate belts. 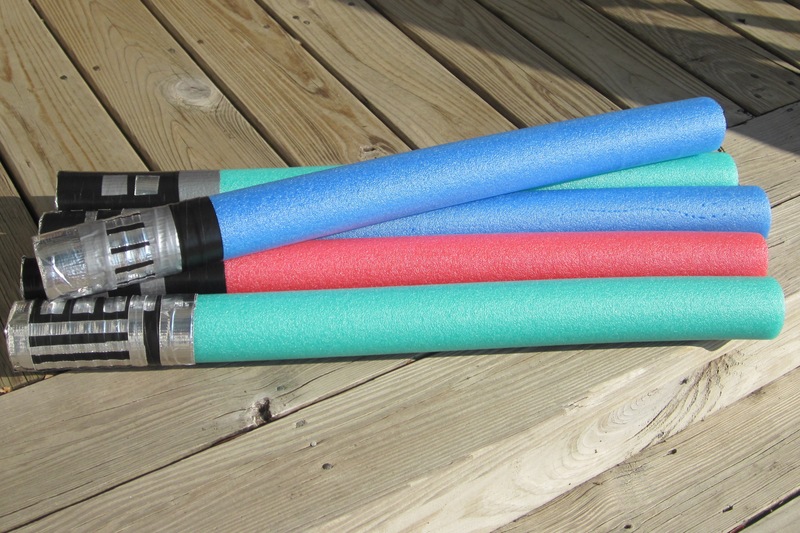 We made the lightsabers from pool noodles. I followed directions that I found on Pinterest, which were clear and easy. My children did most of the handle work themselves. FYI– blue and green lightsabers are the good side of the Force; red is the Dark Side. The Tablescape: Sewing sister came through on this one too. She forwarded a slumber party idea to me that showed how to use twin bed sheets to make your rectangular dining table look like a made up bed. 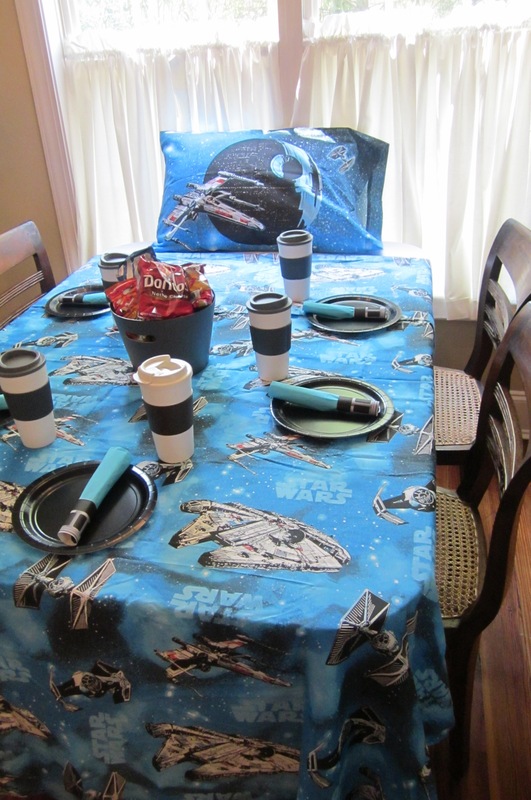 I found the Star Wars sheets at Target for about $20. These are NOT Egyptian cotton, so if you choose to use them on your regular bed after the party, you may want to wear a rash guard with your pajamas. 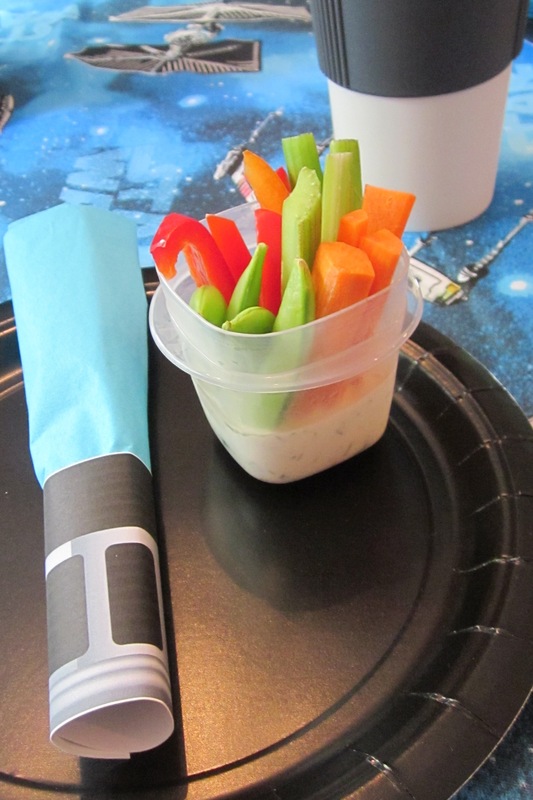 If you watch the original Star Wars movie for food scenes (there are not too many), they tend to eat out of tupperware looking things. I saw the travel coffee mugs in the $1 aisle at Target and thought they were perfect. I downloaded the napkin/light saber rings and directions from this website. 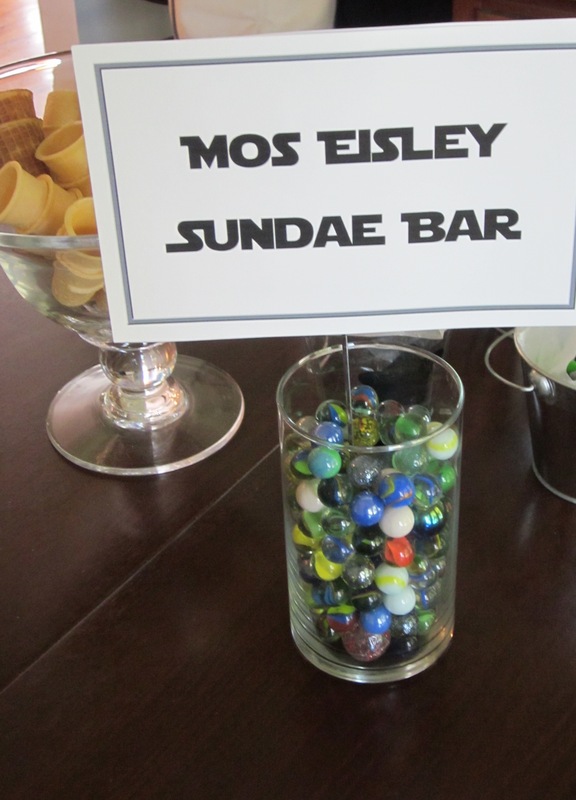 The Mos Eisley Sundae Bar: You find so many good things in that $1 aisle at Target. I found the silver buckets, the grey bins, and the grey bowls during a recent trip. I wanted all of the food containers to have a sort of future/space age feel to them. 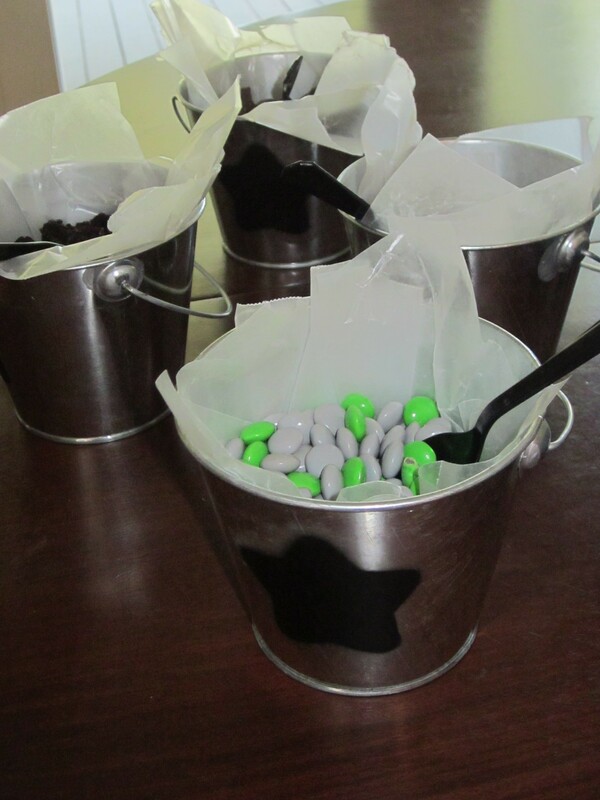 We set out ice cream toppings in black (Crushed Oreos and Thin Mints), brown (chocolate sprinkles), grey (M&Ms), and green (M&Ms) colors. 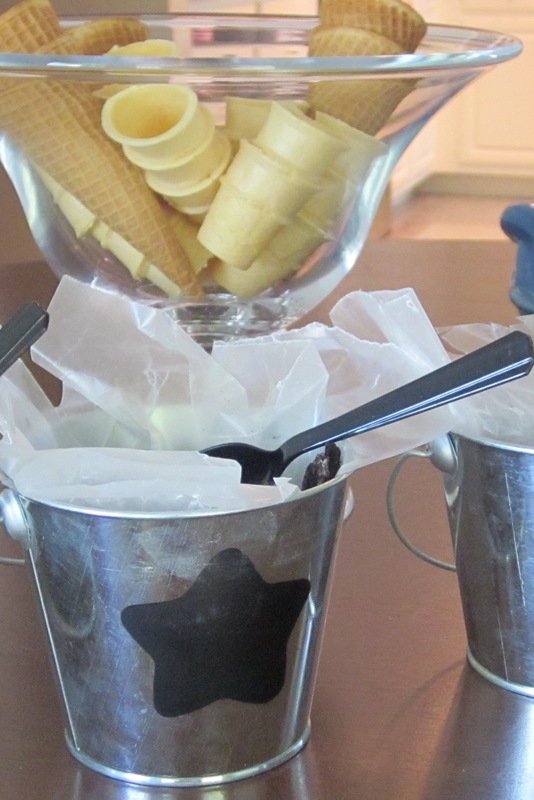 I sort of copied the ice cream sundae bar from my niece’s birthday party. 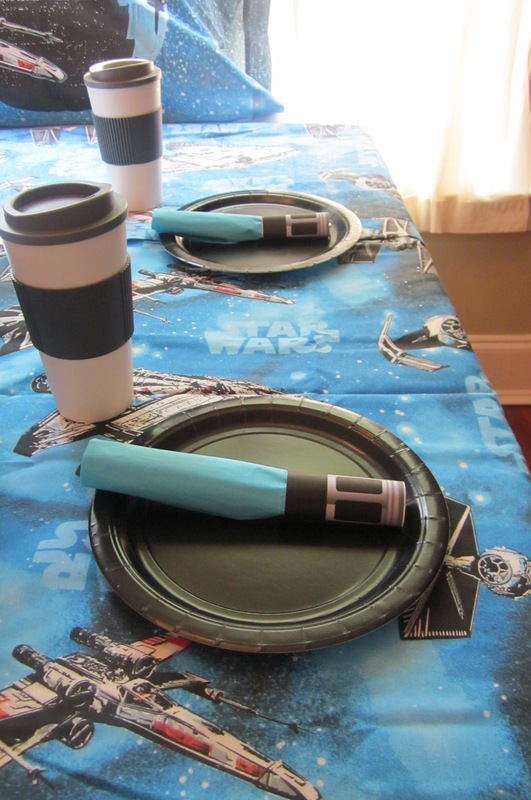 The Mos Eisley Breakfast Bar: I went with the future/space age thing again. In the Empire Strikes Back movie where Luke eats on Dagobah and meets Yoda, he eats something that sort of looks like a dog biscuit but is probably a freeze dried jerky kind of thing. I thought granola bars and mini cereal boxes would fit in with that type of food. 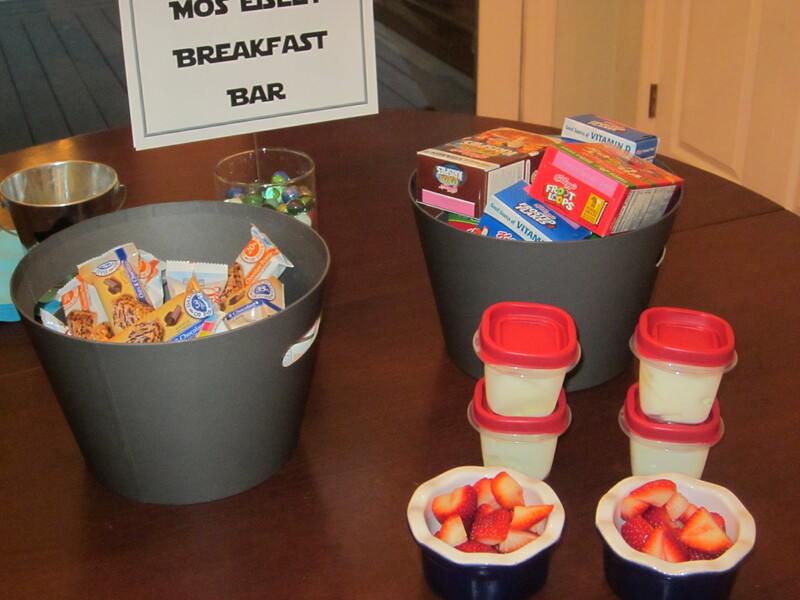 I also served vanilla yogurt in mini tupperwares with some fresh fruit topping choices. The yogurt was an homage to that blue/green smoothie type drink Luke poured himself while at dinner with Uncle Owen and Aunt Beru near the beginning of Star Wars. You may be wondering how I am able to recall so many details of the original Star Wars movies. I’ll just say that I am very good at Star Wars Trivial Pursuit and leave it at that. 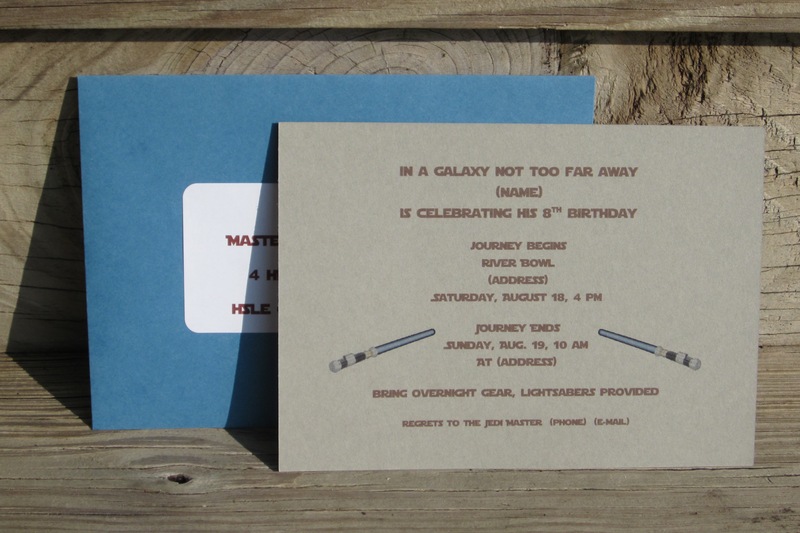 The Party Favors: The guests took their Jedi outfits home as the party favors. They also took the travel coffee mugs too.